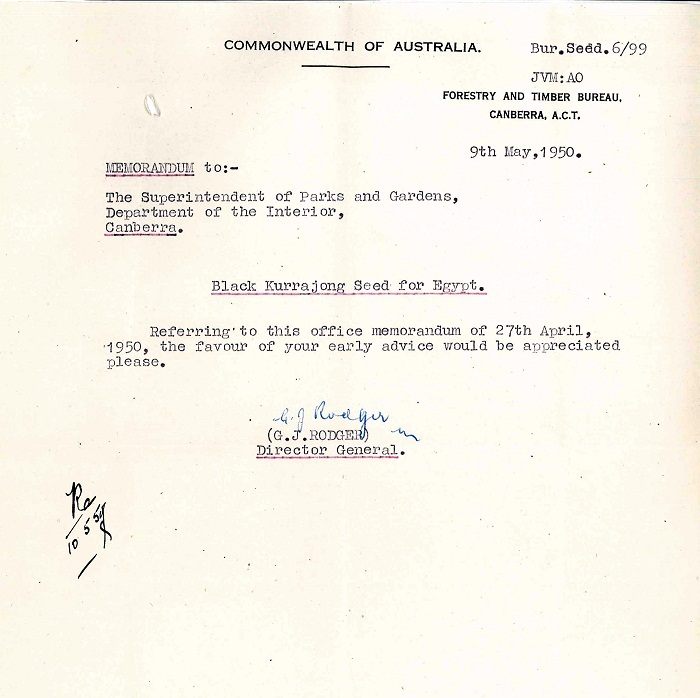 In March 1950, the British Administration in Egypt wanted Kurrajong seeds. 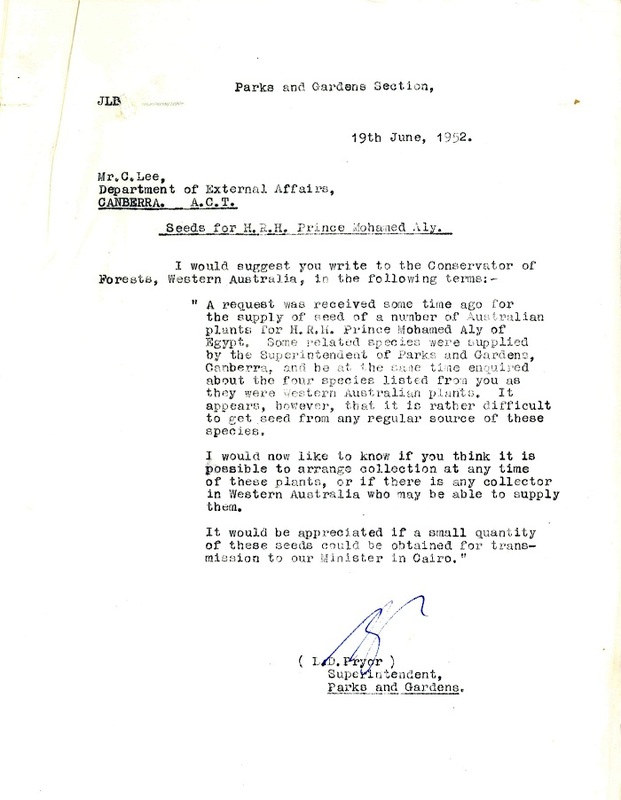 Kurrajong leaves make useful fodder, and the British, wanting to experiment with the trees in Egypt, approached the Australian High Commissioner there for help in getting hold of seeds. 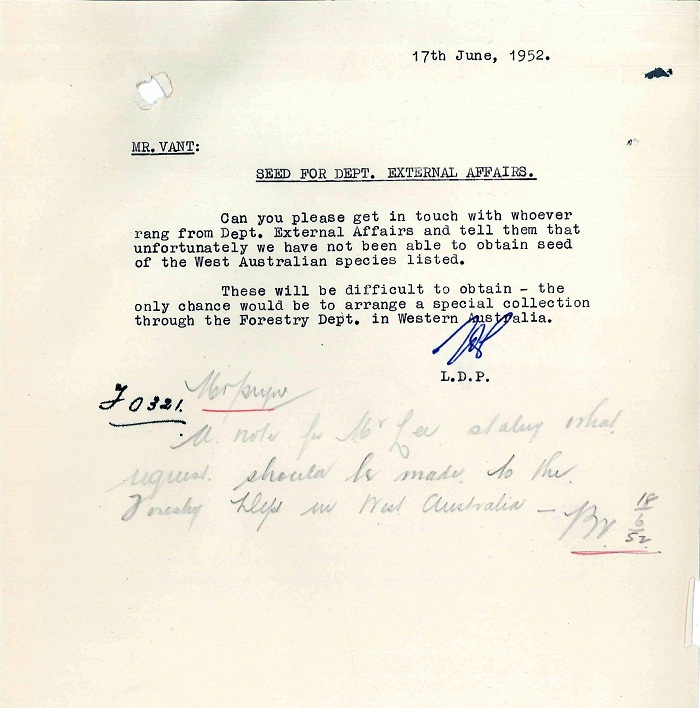 The request made its way to Canberra and the capable hands of Lindsay Pryor. 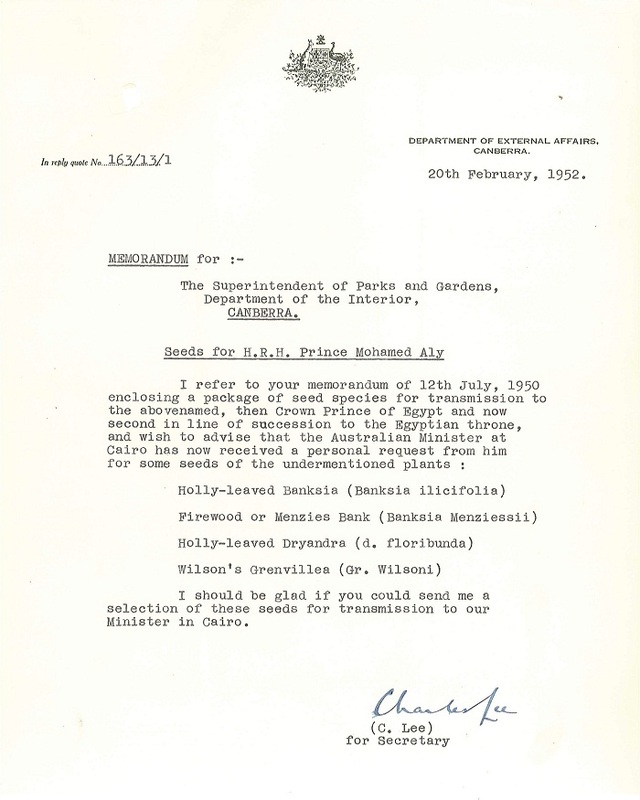 The Superintendant’s knowledge was called on again in 1952 when His Royal Highness the Crown Prince Mohamed Aly of Egypt wanted Banksias, Dryandras and Grevilleas sent to Cairo. Unfortunately, some of the particular species of interest to the Prince were Western Australian varieties, and hard to obtain. 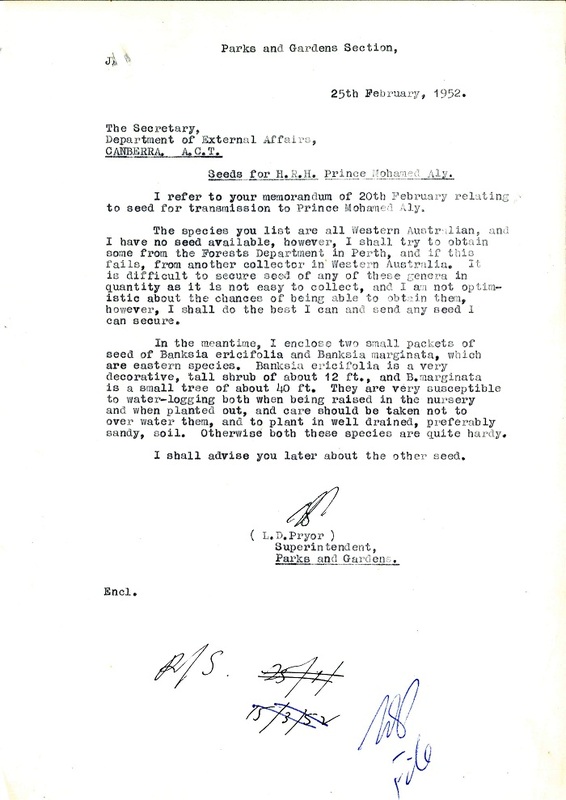 Pryor arranged to supply seeds of similar, eastern species, and despatched them with instructions to “take care not to over water them, and to plant in well drained, preferably sandy, soil”. 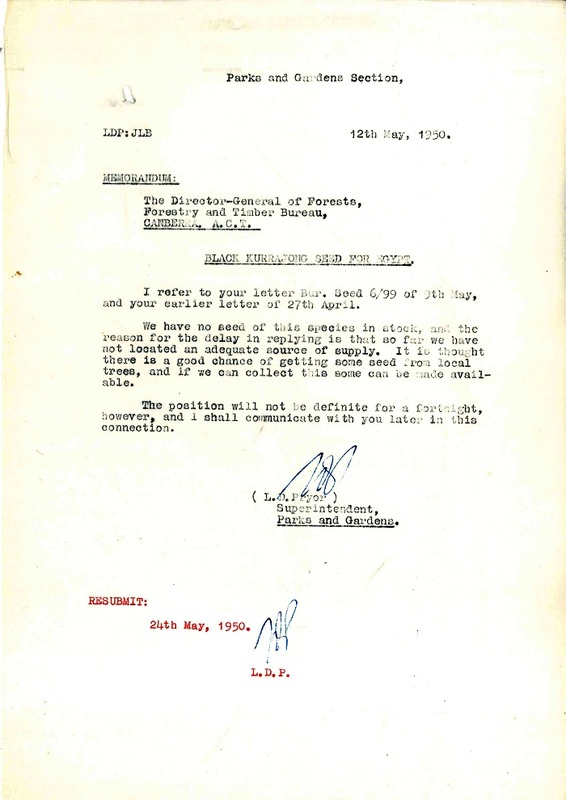 ArchivesACT has selected this Find of the Month to coincide with the official opening of the National Arboretum Canberra. 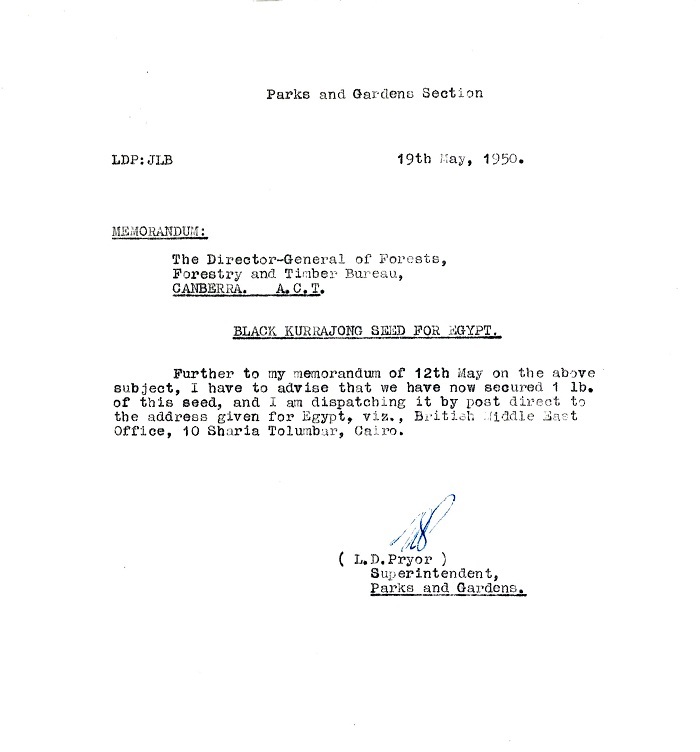 The file is 'LF1047 – Department of the Interior – Australian Govt. 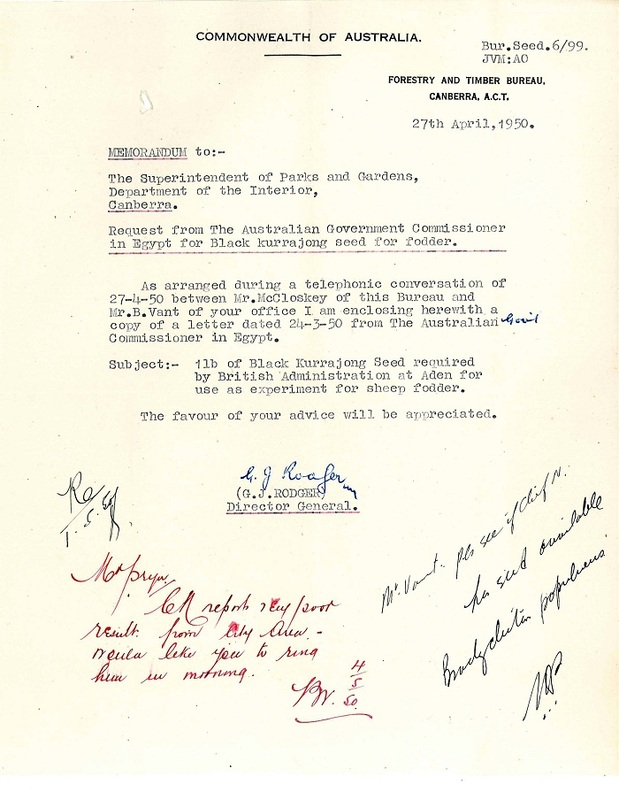 Commissioner in Egypt [1/3]'. At first glance this file title appears to be unrelated to the plants. 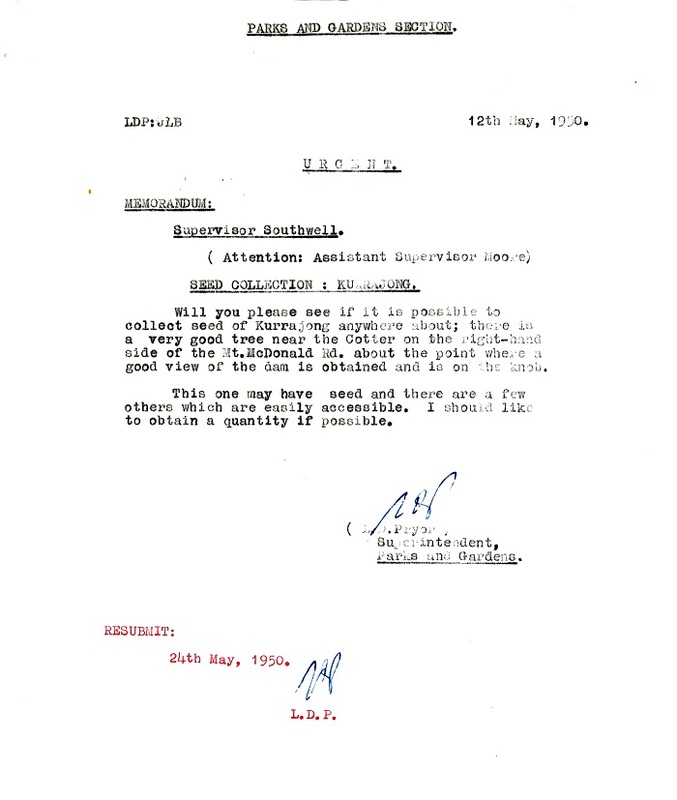 ACT Government files are currently titled using the Territory Whole of Government Recordkeeping Thesaurus that incorporates the Territory Version of Keyword AAA. It provides a controlled vocabulary of terms designed for use in the classifying, titling and indexing of records on creation. This creates record titles that clearly describe the function of a file and its contents. 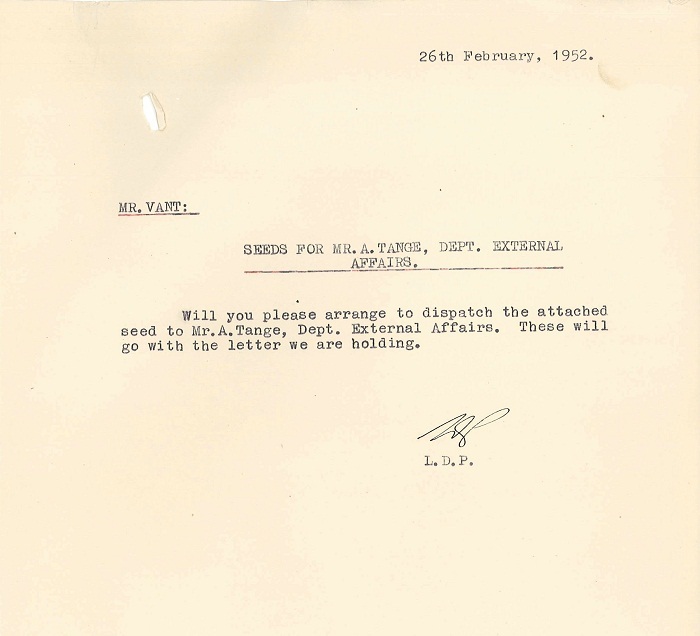 Prior to using a dedicated thesaurus for titling, many older files available through ArchivesACT have titles that fail to adequately describe their contents. 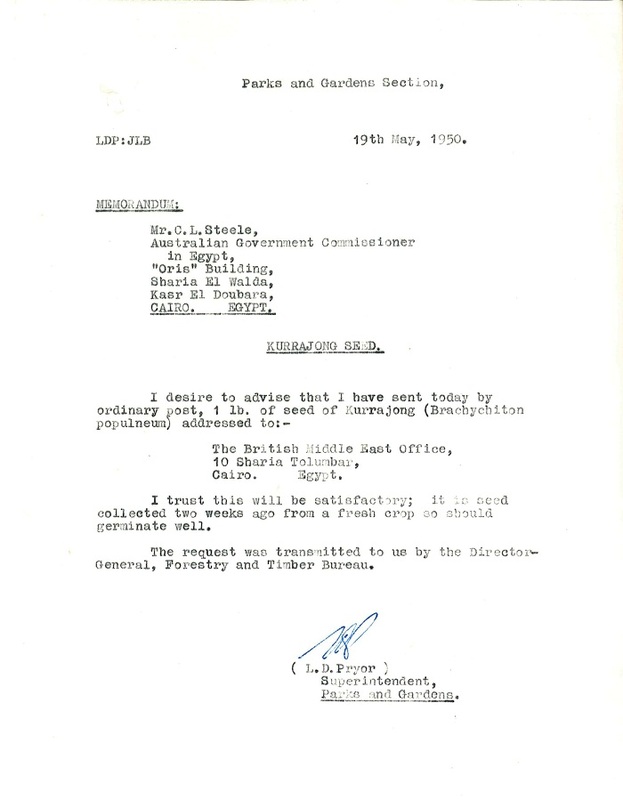 This can hinder research as relevant files may be overlooked due to poor titling. 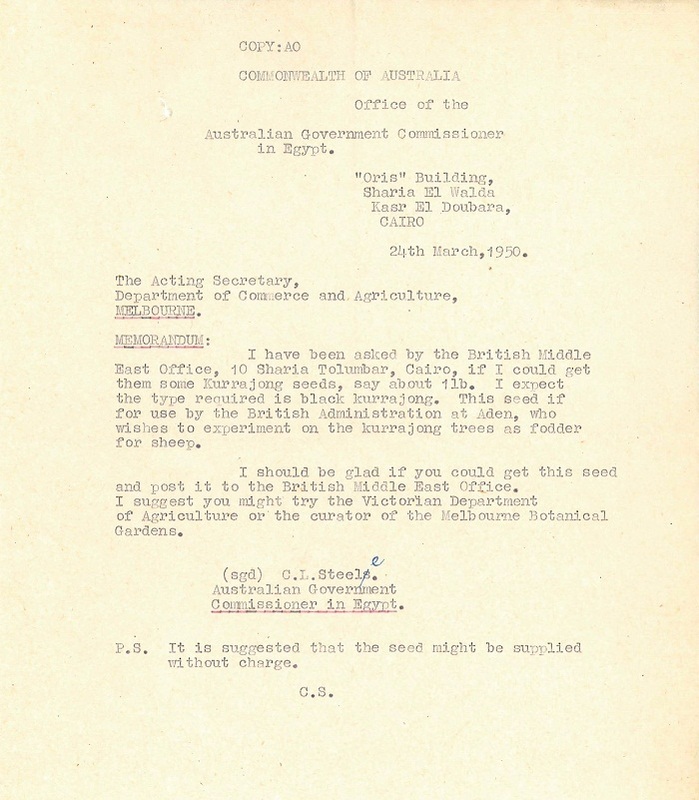 Using the current rules for file titling in the ACT Government, this file might now be titled 'Territory and Municipal Services Directorate - Parks, Reserves & Public Places Records - Horticultural Services - Supply of native seed to Australian Commissioner to Egypt'.